This image is from Erik Kwakkel’s “Turning Over a New Leaf project” Flickr. Moving On: From Manuscript to Movable Type is a short essay introducing a brief history of manuscripts and printing leading up to broadside ballads in early modern England. This essay will show the importance of looking at the textual history and the transition of Marlowe’s text from a verbal poem to a printed poem and, later, to a broadside ballad. In early modern England most verse was written not for print publication, but for manuscript transmission. Lyric poetry, for example, was a literary form that was regarded as basically occasional and ephemeral, designed to be passed in manuscript transmission first to known readers socially connected in some way to the authors, and then to a wider social world. Manuscript culture still had a strong hold on court society. Poetry, in the form of manuscripts, was passed around the court. Like the broadside ballad, these poems were performed by the reader as a new interpretation and not as a mere static repetition.2 This circulation of manuscripts was the best way for the elite to share their work within a trusted circle, rather than allowing a printed text to disseminate into the public. The making of a manuscript was a time-consuming process. It involved making and preparing the parchment, copying down the text (making corrections if need be), and, if the manuscript was meant to be a part of a collection or book, binding it into book form. For much of the Middle Ages the skin of animals was turned into parchment,3 and vellum was parchment made specifically from calf skin. The date given to the invention of paper is around A.D. 105 in China, although there is some conjecture on this date being 200 years later. From China, paper making moved to Korea, where production of paper began as early as the 6th century AD.4 Prior to the invention of paper, Chinese scribes would write with a pointed stylus on strips of wood or bamboo.5 It was not until the 12th century that paper began to be imported into Europe, and around the 13th century paper began to be manufactured in Italy, from which it spread all over the West throughout the 14th and 15th centuries. By the mid-14th century paper was largely replacing parchment, and by the 17th century the options for paper quality became increasingly diverse. Read more on manuscripts, Quill: Books before print. The history of printing goes back before the Gutenberg Press (1440), starting around 206 BC in the Han Dynasty with woodblock printing, a process known today as xylography. Xylography involved carving words and pictures into wooden blocks, inking them, and then pressing textiles (fabric),and later paper, onto the blocks. 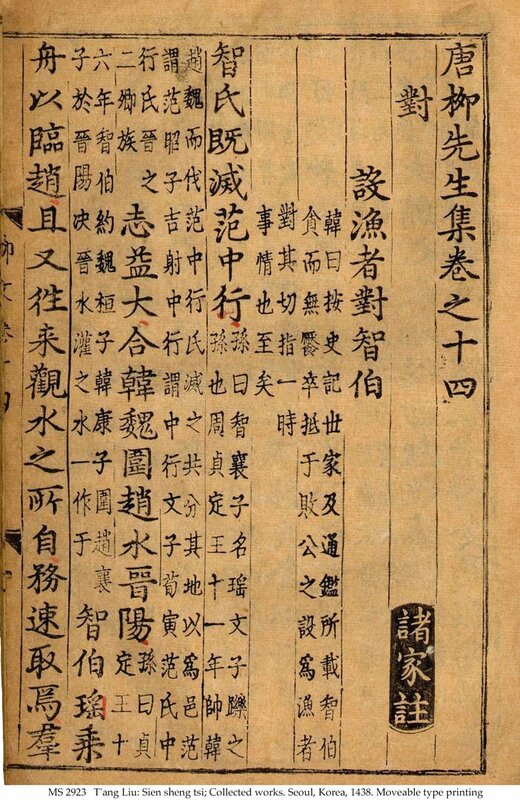 Each block consisted of an entire page of text and illustrations.6 Later developments in printing include the movable type, first developed by Bi Sheng in China. At first clay was used to form the blocks, but by 1298, clay was replaced by wood for its durability. At the beginning of the 12th century, copper movable type was used in China for large-scale printing of paper money. Movable type then spread to Korea, and around 1230, bronze overtook copper in the production of movable type. Printing technology quickly spread and was improved upon; the printing culture encouraged versatility and invention in printing materials used, in technique, and greatly influenced later printing machines. Broadside ballads were a form of popular literature, sold by peddlers and bards, which advertised the perceptions of the community. These printed ballads were not just useful as entertainment or decorations pasted on walls, but also as a form of social commentary.18 According to Joy Wiltenburg, ballads promoted a “unified public mind—or better, a public heart, committed to peaceful order and to the religious and political means of achieving it.”19 The popularity of ballads and their ability to transform and spread shows that they did represent common norms of feeling. As you will read in The Broadside Ballad, broadside ballads represented a variety of themes from courtly romance, work conduct, marriage, critique of government and politics, to issues of crime and punishment. 1 Kwakkel, Erik. 12th century manuscript from the Leiden University Library, shelf mark was not given. Digital Image, “Turning Over a New Leaf project,” 2014, Flickr. 2 Healy, Thomas. “Reading Contexts for Renaissance Lyrics.” Literature in Context, edited by Rick Rylance and Judy Simons, Palsgrave, 2001, p. 55. 3 Kwakkel, Erik, and Giulio Menna. “Choosing a Writing Support: Skins and Scraps.” Quill Books before Print, N.p., Oct, 2014. 4 “The History of Paper.” The History of Paper, Silk road Foundation, 1997-2000. 5 Hunter, Dard. Paper Making: The History and Technique of an Ancient Craft. Dover Thrift, 1978, pp. 48-50. 6 Martin, Roberta, Huntington, Madge, Ebrey, Patricia, Schirokauer, Conrad. “Technological Advances During the Song Dynasty.” The Song Dynasty in China | Asia Topics in World History. Columbia University, 2008. 8 Tucker, David. “History of Publishing.” Encyclopedia Britannica Online, Mar, 2015. 9 Gutenberg Bible Facsimile Leaf, 1934. Modes of Codex: The Art of the Book from Medieval Fragments to Movable Type and Fine Press Printing. UCSB Library, Special Collections. 10 Moon, Danelle. “The Gutenberg Revolution.” Modes of Codex: The Art of the Book from Medieval Fragments to Movable Type and Fine Press Printing, UCSB Library, Special Collections, 2016. 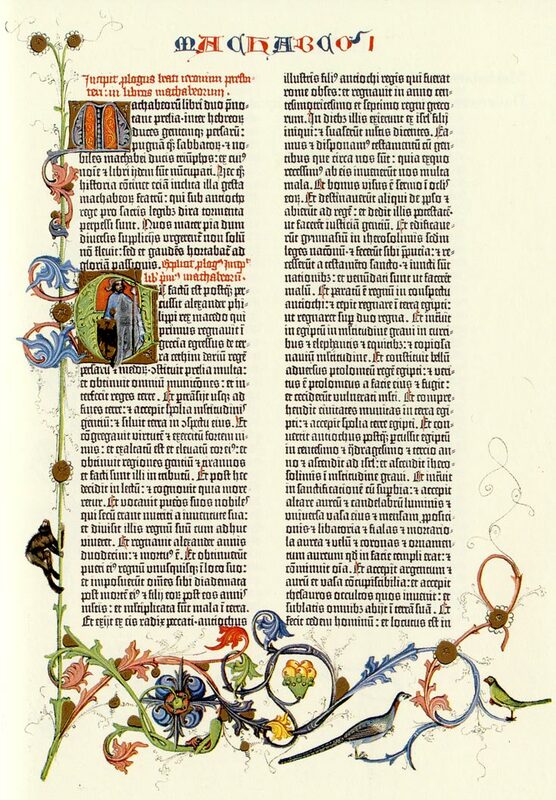 11 “The Ink.” Gutenberg Bible: Making the Bible. British Library, n.d.
12 To view a visualization of the change in the number of printers in London from 1500-1700 created by Eric Nebeker, click here. 13 Siebert, Fred S. Freedom of the Press in England, 1476-1776: The Rise and Decline of Government Controls. U of Illinois, 1952, p. 25. 14 Kernan, Alvin. Printing Technology, Letters, and Samuel Johnson. Princeton University Press, 1987, pp. 59-62. 15 Bartholomaeus, Angelicas. “Batman vapor Bartholomew his books De proprietatibus rerun newly corrected, enlarged and amended: with such additions as are requisite, vnto euery seuerall booke: taken foorth of the most approued authors, the like heretofore not translated in English. Profitable for all estates, as well for the benefit of the mind as the bodie, 1582.” London: Imprinted by Thomas East, dwelling by Paules wharf, 1582, p. 455. 16 “TIMES PRECIOUS JEWEL, / OR, / A DIALOGUE between a / YOUNG-MAN and DEATH. 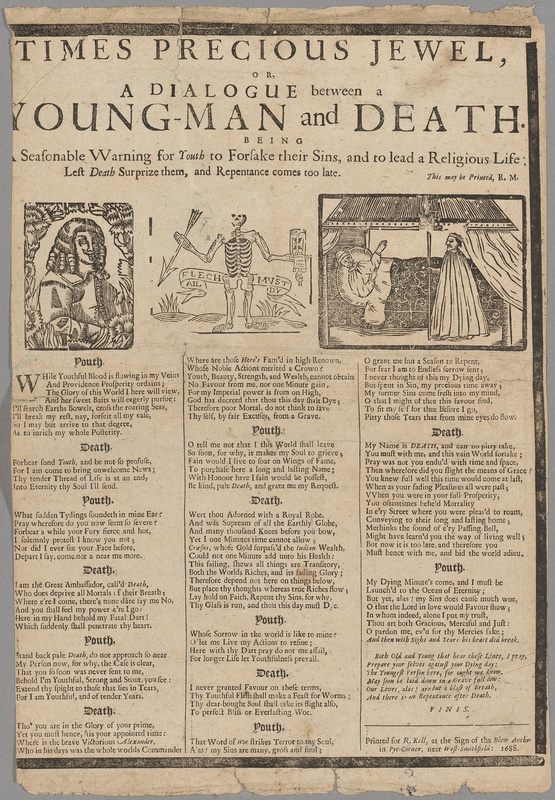 / BEING / A Seasonable Warning for Youth to Forsake their Sins, and to lead a Religious Life: / Lest Death Surprise them, and Repentance comes too late,” Houghton Library, EB65 EB65 A100 688t, EBBA 34565, English Broadside Ballad Archive (EBBA). 17 Fumerton, Patricia. “Remembering by Dismembering: Databases, Archiving, and the Recollection of Seventeenth-Century Broadside Ballads.” Ballads and Broadsides in Britain, 1500-1800, edited by Patricia Fumerton, Anita Gerri, and Kris McAbee, Ashgate Publishing, 2010, pp. 25-26. 18 For example, Thomas Deloney was a clothworker and ballad writer who wrote ballads that criticized the cloth industry. For more on Thomas Deloney see, Hentschell, Rose. “Clothworkers and Social Protest: The Case of Thomas Deloney.” Comitatus: A Journal of Medieval and Renaissance Studies 32, no. 1, 2001, pp. 43-67. 19 Wiltenburg, Joy. “Ballads and the Emotional Life of Crime.” Ballads and Broadsides in Britain, 1500-1800, edited by Patricia Fumerton, Anita Guerrini, and Kris McAbee, Ash gate Publishing, 2010, p. 175. 20 This version was also transcribed in John Henry Ingram’s Christopher Marlowe and His Associates, 1904, pp. 222-226. The earliest dated entry in the Thornborough Commonplace Book Commonplace Book is 1570.